San Juan Budget Hotels: The Hostel @ San Jorge - Everyday Discount Rates! Best Budget Hotel in San Juan! Welcome to San Juan's best choice for everyday discounted rates for a full service hotel clean, comfortable room, 24 hour front desk and complimentary continental breakfast. All standard rooms have FULL size beds, free WiFi , cable TV, key-card entry, air conditioning, mini-fridge, phone, safe deposit box, and private bathroom (shower/no tub). Microwave & Vending Machines available in lobby. Coin-operated washer/dryer on 2nd floor terrace. Our location is great - 15 minute walk to Ocean Park Beach, Calle Loiza 'hipster' action, Plaza del Mercado 'La Placita' for celebrity chefs and local street parties. 15 minute bus ride to Old San Juan, Condado or the Convention Center. We're just down the street from Late 23 Food Trucks, 24-hour supermarket, museums, restaurants, nightlife, theaters, Fine Arts Center and more! 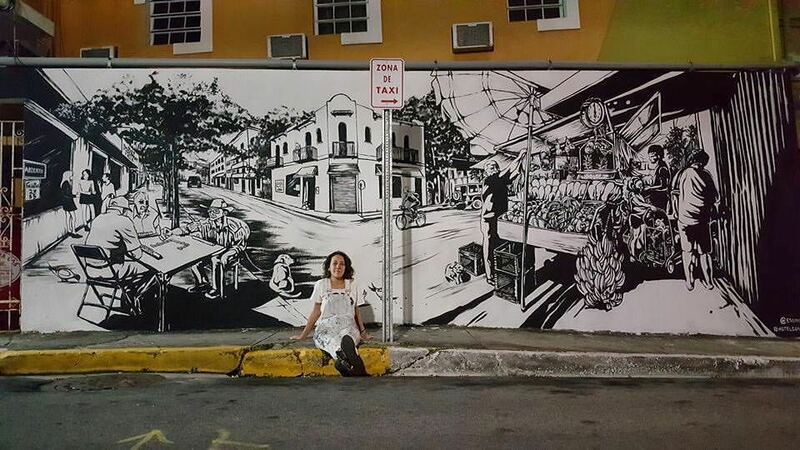 Hotel San Jorge is home to local artist Sarah Urbain's murals which depict traditional street scenes of our Santurce neighborhood. We also have a summer 'artist-in-residence' program with creative guests from all over the world visiting to contribute their creativity to our hotel and neighborhood. Artist Sarah Urbain mural with local street scenes.